GIS Day 2009 at the University of Kansas was an unquestionable success. Now in its 8th year the GIS Day Symposium continued its trend of bringing a quality mix of speakers to the university and attracting a diverse crowd from academia, government, and business. The speaker selection was balanced and had elements of GIS data structures for moving objects, open source software, biological conservation, transportation infrastructure modeling, and flood inundation modeling. The information fair (which started three years ago) had the largest vendor participation yet and the modified location in the Kansas Union, to the main lobby on the fourth floor for the information fair and Alderson Auditorium for the talks was a nice pairing. I am continually impressed with the quality of work presented in the student competition (full disclosure: I participated this year as well, more on this below). This was the first year in the last six that I didn’t have a significant hand in the planning of GIS Day. While initially I wondered what would happen to the day, I can safely say this year was one of the best. Eric Weber (a MA student in Geography) stepped up to continue the tradition of Geography graduate student leadership, and Xan Wedel (KU Institute for Policy and Social Research), Rhonda Houser (KU Libraries), Joel Plummer (KU PhD Candidate in Geography), and Xingong Li (KU Professor in Geography) continued with their longstanding efforts as members of the Planning Committee. I can assure you that it is not easy to plan and execute a GIS Day and these folks (along with the other KU geography graduate students who helped out) deserve a lot of thanks for putting in the effort. Personally, it was extremely gratifying that all of our hard work in previous years carried through in this the first year that didn’t involve either myself or Matt Dunbar (who was integral to GIS Day for the first five years). 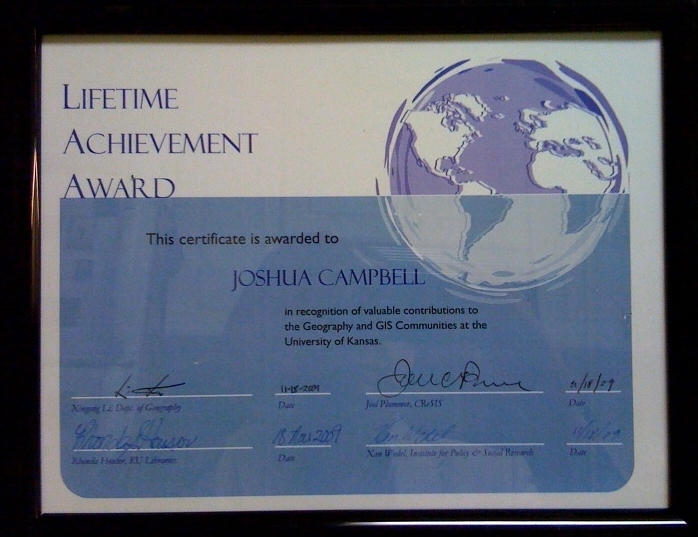 As a tongue-in-cheek joke, but I hope also sincere gesture, the long-term members of the planning committee listed above surprised me with a ‘Lifetime Achievement Award’ for significant contributions to the Geography and GIS communities at KU. While I recognize the intended humor in this, I really do appreciate my colleagues recognition of the many years of effort I put into GIS Day. If this year is any measure, we’ve created a framework for success and built something that can last into the future. The presentation and videos for the day will be available on the GIS Day website in the coming weeks. My presentation is available at this link. The final report of the project and data files will be posted later.